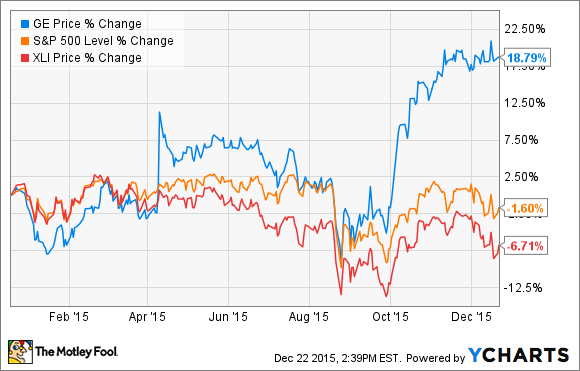 Can General Electric Company Outperform in 2016? The industrial giant has plenty of earnings drivers in 2016 and beyond, and many of them do not rely on the economy. General Electric Company (NYSE:GE) has notably outperformed the S&P 500 and the industrial sector in 2015, but is it possible that the age-old industrial conglomerate can continue this strong performance in the new year? The answer to the question lies in assessing what went right in 2015, and asking if it's a one-year blip, or a sustainable operating trend. CEO Jeff Immelt recently presented the company's annual outlook meeting, and much of what he outlined helps answer these questions. Let's take a closer look. Hit its EPS target, and in doing so, convince the market that falling oil & gas prices wouldn't damage earnings prospects. Successfully generate orders with its new hardware products, specifically Tier 4 regulation compliant locomotives, HA turbine, and LEAP aircraft engine. Execute on its plans to divest GE Capital assets and continue the toward an industrial focus. The company did all of these things in 2015, and the market rewarded shareholders accordingly. Moreover, a marked deterioration in prospects for industrial production growth forced many of its industrial peers to cut earnings guidance through the year. Meanwhile, General Electric was one of the few to raise guidance as recently as the third quarter. What about 2016 and beyond? The first consideration is an extension of ongoing plans, and interested readers can learn about the importance of General Electric's services business and how it ties in with growth potential in the industrial Internet. Essentially, the two divisions work in tandem to drive business, with the increased interoperability of the industrial Internet aiding services revenue generation. Indeed, as CEO Jeff Immelt argued in his presentation, General Electric is the only company offering products, data analytics, and the analytical operating platform (Predix). The company's plans with Alstom were laid out recently. As you can see in the diagram below, the bulk of the EPS walk to at least $2 in 2018 is coming from corporate actions such as buybacks from reducing capital assets and the Alstom integration. Source: General Electric Company annual outlook investor meeting. It's the most interesting takeaway because it offers the potential for upside surprise. The following chart outlines management's intent to increase industrial segment's gross margin by 50 basis points (where 100 basis points equals 1%) every year, helping result in operating margin improving from 14%-14.5% in 2016 to 16% in 2018. One way the company hopes to do this is by increasing product margin from around 5% in 2015 back closer to its historical margin of around 8%. To this end, Immelt laid out cost reduction initiatives across its four biggest segments (power, aviation, healthcare, and oil & gas). Some of them involve standard supply chain initiatives like reducing suppliers and more aggressive negotiations (healthcare and power). However, the most interesting aspect is the potential for digitization and the industrial Internet to help reduce costs. For example, at the Mind + Machines event, Immelt outlined how the use of the industrial Internet had already produced some $400 million worth of internal productivity gains and helped reduce the design time on the HA turbine by half. All the better, the gains are unlikely to stop there. In reality, the industrial Internet is an evolving and iterative process, and General Electric has the opportunity to reduce the cost per unit production as it ramps up manufacturing on its new high-ticket products such as the HA turbine in power and LEAP engine in aviation. Moreover, just as we saw with the reductions in design cost on the HA turbine, the oil & gas segment can also use the industrial Internet to reduce design costs in the future. All told, in a slow-growing economy, General Electric remains an attractive stock. Growth in high-margin services revenue and industrial Internet applications should drive earnings growth in the future, while the company's new, and key, high-ticket products (LEAP, HA turbine, and Tier IV locomotives) all have orders and backlog to fill. The ongoing transition toward an industrial focus is being rewarded by the market, while the Alstom integration is set to be EPS accretive in 2016. Of course, it's not just about top-line growth. General Electric also plans to grow earnings by cutting costs. The upside potential for increased product cost savings from utilizing the industrial Internet is something that could surprise on the upside in 2016, and it makes General Electric an attractive stock compared to its peers.